The 2017 AGM brought a number of changes to the Group as two of our longest-serving officers stepped down from their terms of service. After twenty-five years ( including fifteen as Social Secretary and five as Chairman) Robin Mackervoy concluded his five-year Presidency. We are delighted to have as our new President another very well-known figure on the wider art scene, Roger Dellar. In taking over, Roger paid warm tribute to Robin for his term as President, firmly based upon the Group’s traditions. Further changes followed. Geoff Hunt took over from Alan Runagall as Chairman, and in turn thanked Alan for his five years as a very hard-working, dedicated and unflappable Chairman. Alan too had served as an officer for twenty-five years. John Killens was elected to the post of Secretary after seven years as Social Secretary, and that role now goes to Karl Terry. 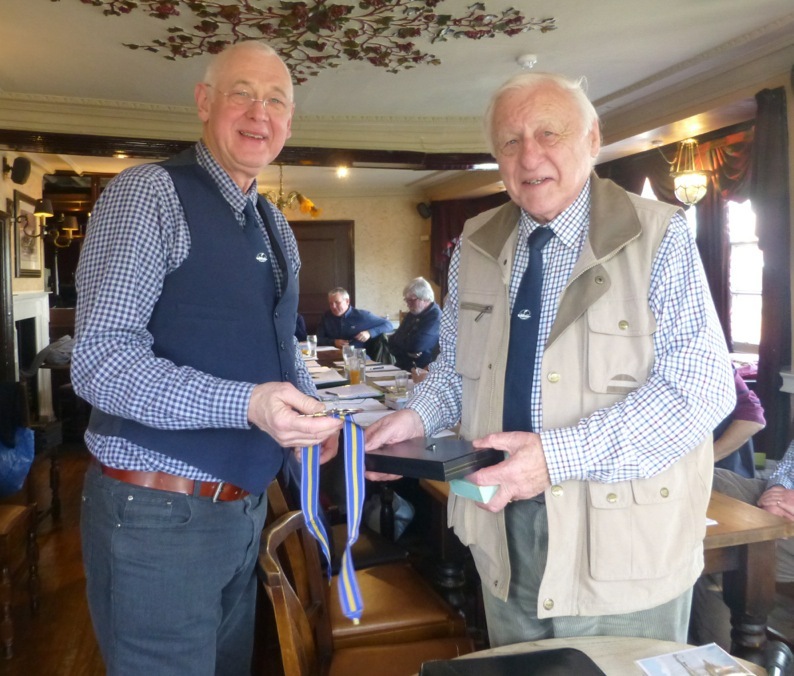 Having formally established the category of Honorary Member, the meeting went on to award this distinction to John Powley. Chris Burdett continues as a Candidate for the 2017 season. 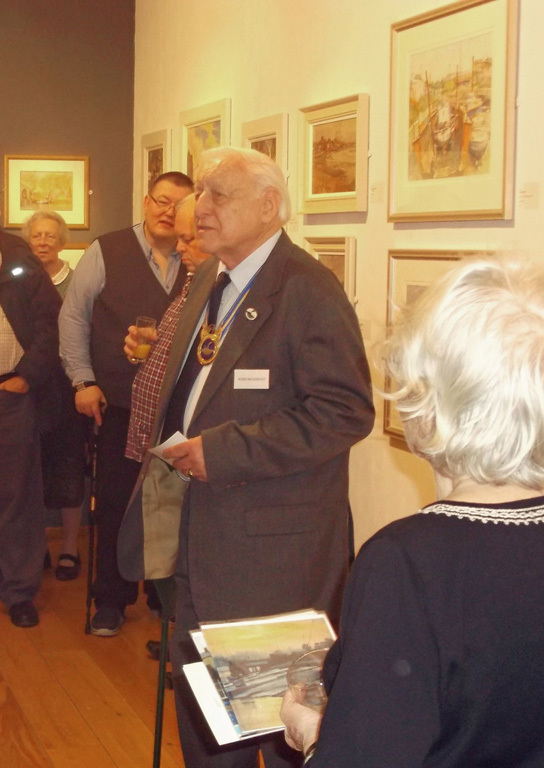 The Group’s 71st exhibition opened on Sunday 12 March at the Mall Galleries, closing at 4pm on Saturday 18th. 138 framed works were shown by the members and candidates. As usual, many different places were visited by the membership last summer, so the subject matter was very varied depicting not only the River Thames, but subjects further afield such as Faversham and Maldon, as well as a few City of London scenes. The exhibition was opened by our retiring President Robin Mackervoy who is standing down after 25 years’ service to the Group. Robin thanked Exhibition Organisers Derek Daniells and Rob Adams and their hanging committee, and also to John Deston and the Mall staff for their excellent work in getting the exhibition on the wall from a 10am start to all finished and labelled by 2pm. The exhibition was very well attended throughout. At the final count 31 pictures were sold, together a number of unframed prints, cards, and some superb booklets of work by Trevor Chamberlain and Bert Wright. There were two noteworthy events during the exhibition. The first, arranged at very short notice, was a live interview on London Live television at midday on the Private View, with Geoff Hunt answering questions about the Group and the exhibition. The second event was an all-day workshop on Wednesday 15th March conducted by Roger Deller on behalf of the Friends of the Mall Galleries. 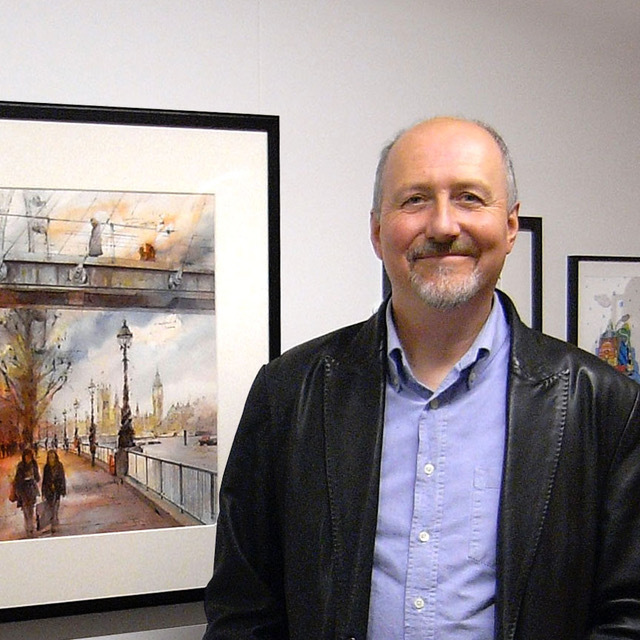 Roger took his eleven students to the Hungerford Bridge area for a ‘plein air’ painting session before returning to the gallery to look at the exhibition and discuss their work.